Lucca & Pisa Tours Include: Our private tours of Lucca and Pisa include private “driving tour guides,” private transportation to and from your hotel or apartment, taxes, tolls and parking. Optional Wine tasting and lunch. A fantastic day trip in Tuscany, a Lucca & Pisa tour. Enjoy a private tour of Lucca, one of the most graceful and elegant cities in Tuscany and Pisa, home to the famous “leaning tower,” with an English-speaking tour guide. 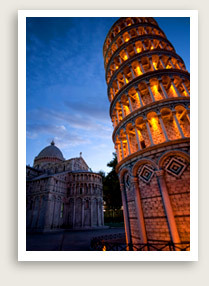 First stop on your guided tour of these twin historic towns is Pisa, a Roman colony from the 2nd century B.C. A naval and commercial port, Pisa became a maritime republic in the Middle Ages, rivaling Genova, Amalfi and Venice. Its peak came in the 12th and 13th centuries, by which time Pisa controlled Corsica, Sardinia, and most of the mainland coast as far south as Civitavecchia. Most of the city’s finest buildings date from this period, when the distinctive Pisan-Romanesque architectural style flourished. Since the 15th century, the city was governed by Florence, whose Medici rulers re-established the University of Pisa, where Galileo, Pisa’s most famous native, once taught. Your guided tour of Pisa will also take you to Campo dei Miracoli, a large, grassy piazza containing Pisa’s cathedral, the baptistery, the cemetery and Pisa’s most famous landmark, the leaning tower. You will wander around this beautiful square and enjoy the amazing architecture. 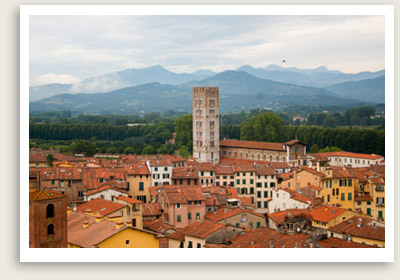 This private tour of Lucca and Pisa may also include wine tasting and lunch at a winery – optional. Afterwards, you will head to Lucca, the birthplace of composer Giacomo Puccini. Lucca, one of the most charming of Tuscany’s provincial capitals, is set inside a ring of well-preserved Renaissance walls. The wall is wide enough to hold small parks and a path along the top. Founded by the Etruscans, Lucca became a Roman colony in 180 B.C. During the 12th century, it enjoyed a period of prosperity based on the silk trade. Lucca remained an independent republic for over 500 years, until Napoleon came along and created the principality of Lucca.